Searching for a quick and easy way to share all your PPTs on YouTube and other video sharing sites? ImTOO Convert PowerPoint to YouTube allows you to convert PPTs to standard/high-definition (SD/HD) videos in H.264/MPEG4-AVC, WMV, HD-H.264, or HD-WMV format, so you can upload, view and share them on websites such as YouTube.com in various resolutions (320×240, 480×360, 640×480, 1280×720, 1920×1080) without installing Microsoft PowerPoint. In addition to PPT to YouTube conversion, you can also use this PowerPoint to YouTube converter to create custom YouTube presentations: rehearse and record commentary, add background music, attach trademarks/logos, adjust output parameters, set the slide transition interval, or remove all original slide animations and effects. 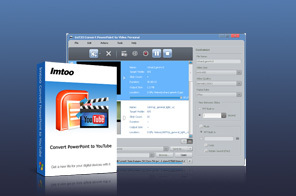 Download ImTOO Convert PowerPoint to YouTube now for FREE! Convert PPTs to YouTube videos (H.264/MPEG4-AVC, WMV, HD-H.264, HD-WMV) with the optimized parameters, which assure you of the best result on YouTube and make them uploadable to YouTube and other video sharing sites. Practice your presentation first, then once satisfied, record your own commentary. You can also add a music clip to the final presentation. Include your own label or logo in the final presentation to prevent it from illegal use or distribution. Sacrifice slide features for speed with "Express Convert" - maximize the PPT to YouTube conversion process by removing all animations and effects from the source PPT file. Convert multiple PPT files to YouTube videos at once for increased efficiency. Adjust parameters and settings such as the video quality, resolution, frame rate, slide playback interval and so on to custom your YouTube video outputs. Keeps all original slide features after conversion. Auto-exit application, hibernate, stand by, shut down system, or do nothing upon completion of all tasks. Supports all PowerPoint file types (ppt, pptx, pptm, ppsx, pps, ppsm, potx, potm, pot) and all PowerPoint versions. Preview presentation and check the final effects prior to conversion. Multilingual (English, German, French, Chinese, Japanese) and multi-skin interface.